"One should build cities in the country, the air would be much cleaner!" said once, one of our all time famous humorists: Alphonse Allais. Well, if you trust this photo, you could think that they've started! 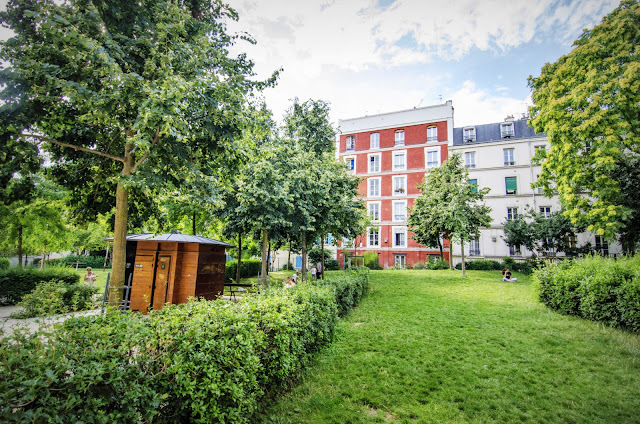 For I did take this shot in Paris and in a very very urban area, near the Place de Clichy (precisely in a little garden square off the Avenue de Clichy). This area used to be pretty ugly, but now it's being totally renovated and people who were patient enough (like the lucky ones who live in this red building for example!) can now enjoy a nice and peaceful view, while being one step away from all the city fuss (and enjoy an increase in the price of their apartment of at least 50%!)! I love this photo! I see that there are few people enjoying this lovely space. What a wonderful oasis from the city! That looks and sounds absolutely wonderful! We need more green spaces in our cities. lovely! ...except for the price increase. Isn't there some sort of rent control or stabilization to protect a tenant? In New York city an apartment can only go up a certain percentage and the landlord would have to petition the court to get that. The tenants could also petition the same court to challenge him or her. Yes, we have rules similar to that. And in addition it is very difficult - and very expensive - to get rid of a tenant who does not pay his/her rent. Landlords are so afraid that it happens to them that they demand all sorts of guaranties to let a tenant in (you must earn at least 3 times the amount of the rent, you must pay a 3 month deposit upfront, and if you're a student or a young adult, your parents must stand security for you). Needless to say that it's very difficult to rent a place in Paris (and in France in general)! It's also very difficult and expensive to get rid of a tenant in New York city! Usually you're charged first and last month rent to get the apartment and even with this you could pay a security deposit. & then there's the 'key money' which is essentially a bribe to the super of the building so that you will be considered for the rental by the landlord! Or did you mean that these people own their apartments, and will now get 50% more than before if they sell? In which case, good for them! I bought in a marginally sketchy neighborhood 20 years ago—let's just say that risk has paid off! Unfortunately, renewal/improvements always seem to come at a higher price. A couple of years ago, a 5-story retirement home near me was involved in a fire. From the exterior, you might never have known there was a fire (a lot of interior smoke damage). But they totally gutted the building and rebuilt from the inside out. It is gradually filling up again, but I know the price of those units (rentals) has probably increased by at least 1/3 or more. The result being, the former residents (if on fixed incomes) most likely could not afford to live there again.